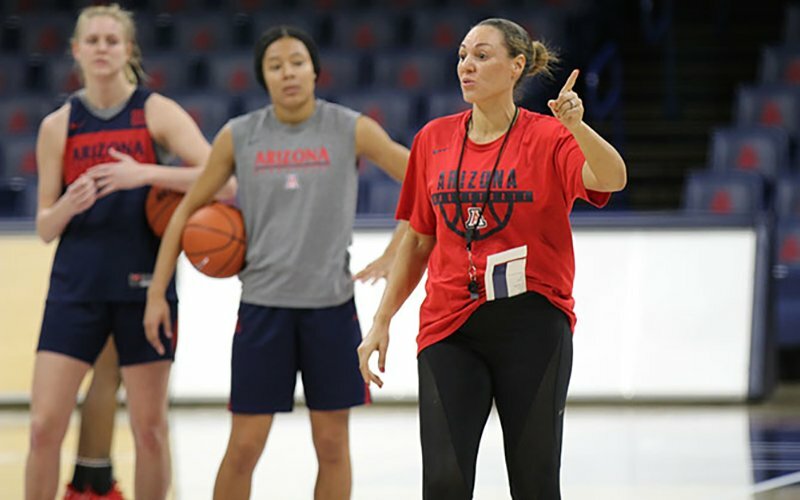 TUCSON – Head coach Adia Barnes knows what it takes to win at Arizona having played there from 1995-98. 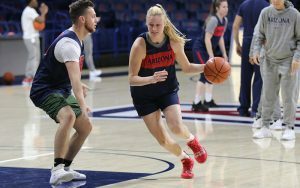 But before Barnes even stepped on to the court, there were skeptics wondering whether she was good enough to play at Arizona. The Wildcats instincts about Barnes as a player were right – she is the most decorated player in program history – and so were their instincts about her as a coach. After posting just six victories last season, Arizona is in contention for its first NCAA Tournament appearance since 2005 as they enter Friday’s game against Arizona State with a 14-6 record. Bonvicini, the winningest coach in school history with a record of 287-223, saw Barnes play in high school at the urging of one of her assistants. When she saw her play live, she offered a scholarship. It paid off. Barnes totaled a school record 2,237 career points, earning Pac-10 Player of the Year and first-team All-American in the 1997-98 season. Arizona, however, didn’t have immediate success when Barnes entered the program. The Wildcats went 11-19 in Barnes’ first season, including a 109-57 loss versus No. 1 Tennessee and a 79-39 loss versus No. 8 Vanderbilt. Those memories have stuck with Barnes. Bonvicini admits that she overscheduled in Barnes’ first season, but it helped jumpstart a highly successful career which exceeded anything Bonvicini could have imagined. In Barnes’ final three seasons, the Wildcats posted three 20-win season, a Women’s NIT championship and two NCAA Tournament appearances. Bonvicini said she wasn’t sure if Barnes would go into coaching but once she got really good playing, it was only natural for her to go into coaching. Returning to her alma mater, Barnes has been tasked to lead the Wildcats back to winning ways. Barnes was hired by Arizona in 2016 and went 14-16 in her first season. Last season, Arizona took a step back posting a 6-24 record finishing last in the Pac-12. Now, thanks to the addition of three key transfers and a top-15 freshman recruiting class, Barnes has the Wildcats in contention for the postseason. 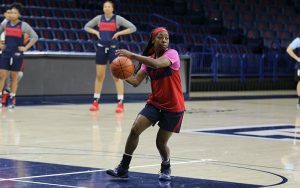 A big reason for Arizona’s resurgence is the influx of talent in the program, headlined by transfer guard Aari McDonald. McDonald knows what it takes to win. The redshirt sophomore transferred from Washington, where she played alongside NCAA’s all-time leading scorer Kelsey Plum. She believes the experience of playing in a winning environment has helped build a similar culture in Tucson. McDonald is the nation’s second-leading scorer averaging 25.2 points per game. According to Her Hoop Stats, McDonald has the third-highest usage rate in the country at 38 percent. Usage rate is the percentage of plays while on the court that ends by that player shooting, getting to the free throw line or turning the ball over. After averaging just 9.8 points per game in her only season at Washington, she’s emerged as one of the most productive players in women’s college basketball. Another player who’s contributed significantly is forward Cate Reese. The freshman from Cypress, Texas, became the first McDonald’s All-American to play for Arizona. Barnes began recruiting Reese her junior year of high school and Reese decided to come to Tucson so she can become an all-around player. Her sister, Ali, attends Arizona and the closeness of their relationship was a large factor in her decision to play for the Wildcats. Considering Arizona’s lack of success in recent years, Reese is excited for what’s to come. That’s the three pillars Arizona women’s basketball abides by. When it comes to trust, Barnes doesn’t want to constantly look over the players’ shoulders. At the beginning of her coaching tenure in Tucson, she had to keep a closer eye on her team. Barnes believes you have to be passionate in everything you do, on and off the court. These core values have helped catapult the Wildcats up the Pac-12 standings, but Barnes said there’s still work to be done in changing the culture. Barnes reflected on her playing career and the work ethic needed to be successful. She thought that she was a hard worker in high school, but then when she stepped on Arizona’s campus, she realized she wasn’t. Similar experience followed Barnes as she needed to ramp up her work ethic when she reached the pros. “I think you understand and learn what that looks like but if you don’t know, you don’t know,” Barnes said. When she first entered collegiate coaching, Barnes wondered why everybody wasn’t at practice. To build a culture similar to those at Connecticut and Notre Dame, Barnes said it takes bringing in new players who could be an example for the others on the team. “When you bring in a player that’s a worker, that likes to shoot, wants to work on her game and it becomes contagious,” Barnes said. “It takes a few players that are like that because then what happens is if you’re not doing that, you’re like, ‘she’s the only one not doing that.’ You don’t want to be the only one not doing that so it’s a little bit of peer pressure but then it’s contagious.